Saber Tooth Cat Skull. Smilodon fatalis. Fossil replica. Complete skeleton was found in La Brea Tar Pits. Large feline carnivore of Pleistocene N America. LA County MNH licensed copy. 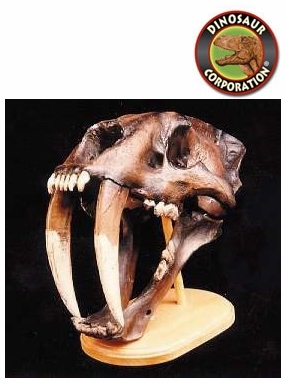 (Also called Saber Tooth Tiger, Smilodon).